My first in-depth conversation on nonviolence with Hamas leader Khaled Meshaal came in the months before the Arab Spring uprisings, when the latter was still chairman of Hamas’s politburo. He emphasized that Hamas did not support armed “resistance” simply for the sake of resisting. But, he was skeptical that nonviolence or “popular resistance” (the preferred Palestinian term for mass protests, often involving stone-throwing), would be effective. On May 14, Israeli forces killed 60 Palestinians during demonstrations on Gaza’s eastern border. 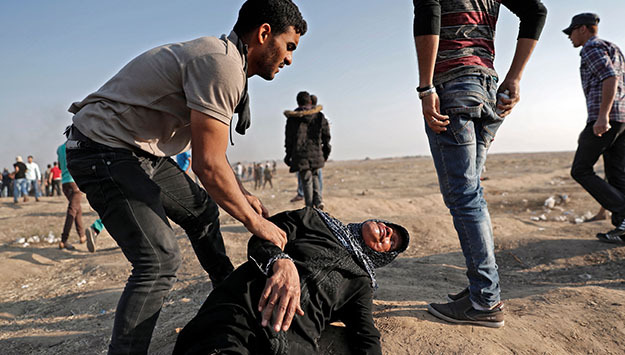 Those losses bring the death toll in a protest movement Palestinians have deemed the Great March of Return to over 100 since March 30. A common narrative in the Israeli and Western media holds that Hamas has “hijacked” the protests for its own ends, and in some respects this is true. The march was the brainchild of Palestinian civil society activists, and it is now being led by a coordinating committee, including political parties and civil society organizations. While Gaza remains occupied (Israel controls its borders, airspace and coastline), Hamas does exercise authority in the interior of the territory. Hamas has long controlled access to the zone near Gaza’s eastern border, and it has proven an ability to regulate periodic Palestinian demonstrations at the border in the past. This is not to downplay the widespread frustration with the miserable status quo in Gaza, nor the broad popular participation in the protests. Rather it is to point out that it would have been very difficult for a protest movement of this scale to coalesce without a green light from Hamas, especially given its security control and logistical resources. In recent weeks, Hamas leaders have invoked explicitly the memory and imagery of Mahatma Gandhi and Martin Luther King to characterize their struggle. In a May 15 conversation, Ahmed Yousef, a Hamas-aligned former deputy foreign minister, emphasized that the young organizers managed to convince the political factions in Gaza, including Hamas, that “nonviolence is a good strategy.” He said that the leaders of the March are “well-educated” in nonviolence and that this was leading to a broader acceptance of these tactics in Gaza, something reiterated by the coordinators of the March. Another indication of support, at least from Hamas’s supporters, are consistent reports from Israeli and Palestinian sources suggesting that a portion of the fatalities are individuals affiliated to Hamas’s security forces. The Trump administration, following in the footsteps of the Obama and Bush administrations, is calling on Hamas to renounce violence. Ever since Hamas won Palestinian legislative elections in 2006, the U.S. and EU have demanded that Hamas disavow violence and extend de jure recognition of Israel. Hamas’s support for the march does not mean it is ready to take such steps—but it is significant nonetheless. Backing largely unarmed demonstrations and calling on protestors to maintain the “peacefulness” of the movement is a far cry from Hamas’s strategy the last time it was similarly cornered. In the summer of 2014, facing Arab and international isolation, deteriorating economic conditions in Gaza, and having made unreciprocated concessions to their Palestinian rivals (dissolving their cabinet in Gaza), Hamas decided to go to war. Hamas used everything it had against Israel—from rockets, to tunnels, to frogmen—in a desperate gamble to shakeup the status quo and generate support for Gaza. Instead of acknowledging that—as opposed to launching rockets—Hamas is supporting a largely nonviolent strategy, the Trump administration is insisting that all blame for the debacle that is Gaza lies with Hamas. The administration appears incapable of issuing a basic call for Israeli restraint. And, in her May 15 press briefing, State Department spokesperson Heather Nauert even evaded acknowledging any link between the Israeli-Egyptian closure of Gaza and the protests. This approach is wrongheaded and dangerous. But, even if war is avoided, in failing to exert meaningful pressure on Israel to lift its draconian closure and in failing to acknowledge, at least tacitly, that Hamas has taken a positive step (in opting for mass marches over rockets), the Trump administration is squandering an opportunity to encourage more moderate elements within the organization. If sustained protests fail to improve conditions on the ground, militants in Hamas and other factions invariably will have a stronger hand.